LATEST UPDATE: His Excellency the President, Ratu Epeli Nailatikau, received the new resident Ambassador for the United States of America to Fiji. 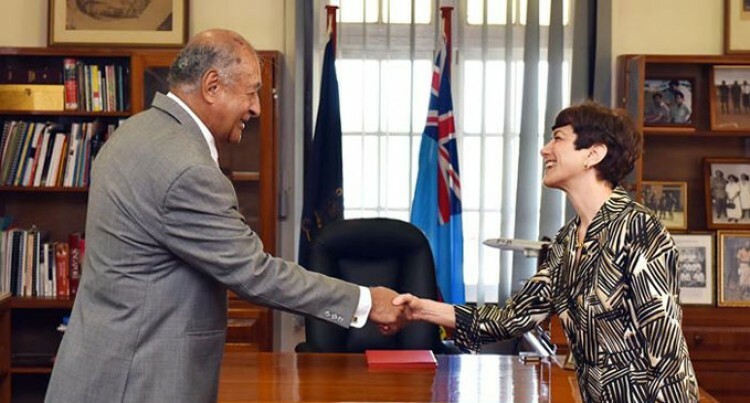 The Fijian Head of State welcomed Her Excellency Ambassador Judith Cefkin to Fiji as she presented her Letters of Credence to him at Government House this morning. Following the presentation of credentials, Ambassador Cefkin and the Fijian President held talks at his office. Ambassador Cefkin has an extensive career in the Foreign Service after joining in 1983 and has represented the US in various capacities at different missions in many parts of the world. HE Cefkin, who is also accredited to Kiribati, Nauru, Tonga and Tuvalu, said she was excited to serve the Pacific Islands. She is married to Paul L. Boyd, a retired diplomat and will be based in Suva.